Time to tighten up my menu plans and provide healthier meals to my family. 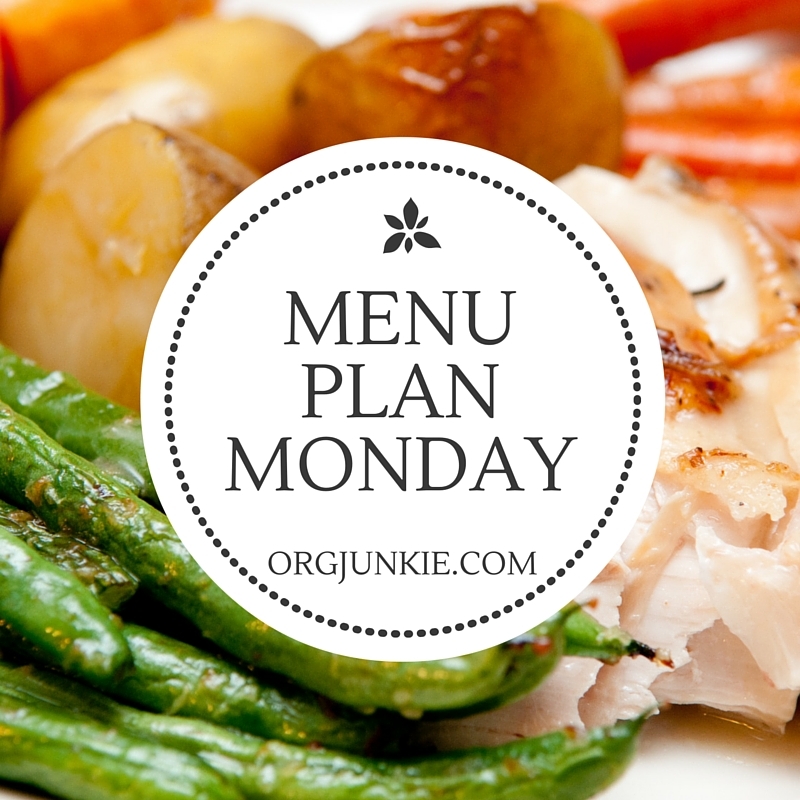 This week's menu plan resembles a more primal life, leaning towards proteins and vegetables and avoidiing processed quick-fix sides. Also avoiding breads and white starches. Here's the plan. If you are curious about "blueberry morning", it is a recipe that was originated by Yuri Elkaim, but I've tweaked it to be my own. It starts with blueberries in a bowl, pour some almond milk over it, and then I cover this with layers of ground flax seed, flaked coconut, hemp seed, pumpkin seed and sunflower seed. My husband says it looks like a bowl of bird seed. Well, it's good for my cholesterol and I find it satisfying. It's worth trying if you are trying to cut your cholesterol naturally. Summer is almost here.The weather is in the 80's. 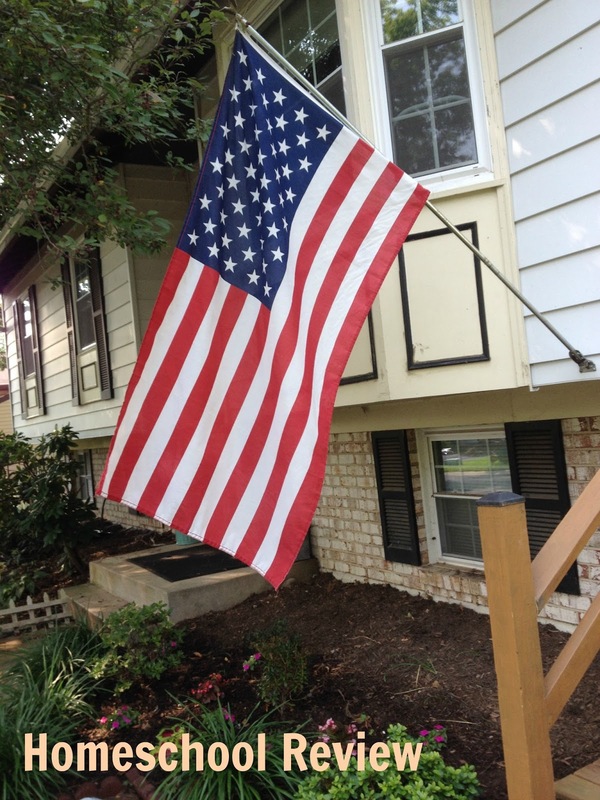 Memorial Day is days away, and the local public school releases its captives in mere weeks. Fun summer ideas? I see Algebra 2 and Calculus in my future, followed by housework and gardening. Summer DIY ideas? My vegetable garden? The quilt I don't have time to work on? Beat the Summer Heat? How about air conditioning, or going to the pool (which I don't have time to do). 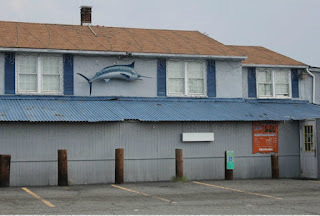 Making Memories with my Family? I don't think I myself will be contributing to good summer memories this year. How about you? Do you have a break coming up? Or does unfinished schoolwork loom into your hot, distant future? Let me know. Part of the plan last week got bumped by a day. Friday was crazy and we got pizza. That bumped all the plans out by a day, so hot dogs moved to Saturday and BLTs got bumped as well. Next week I have a pot luck event to attend; haven't figured out yet what I'll take. 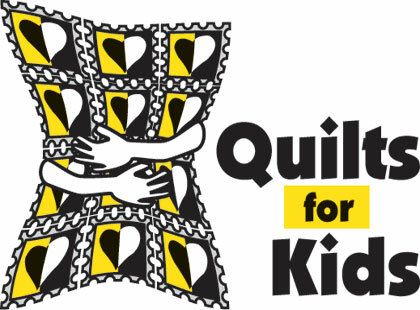 So I am part of a quilting group called MSP Quilting Angels that makes quilts for Quilts of Valor and Quilts for Kids. Today was quilting day. 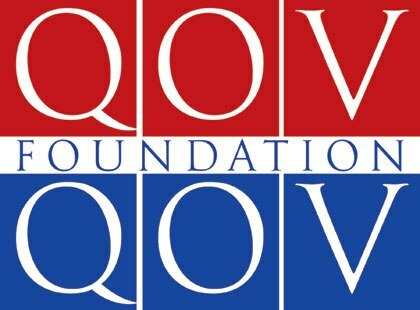 I'm working on Quilts for Kids while I learn -- I'm not quite ready yet to make a Valor quilt. A little background -- I'm still working to complete my first quilt. It is on the sewing machine downstairs in mid-quilting. The top is finished, and I'm machine quilting it. The bobbin jammed (I think I need to rewind the bobbin) and I got frustrated. It's been there two months waiting for me to make time for it. You can find it in the first picture if you look carefully. As I went to photograph that I was reminded that I also have out a stack of bibs to edge to send to my Online Angels charity. So for quilting day today I was working on a second quilt. It will be a "Turn 20" quilt. 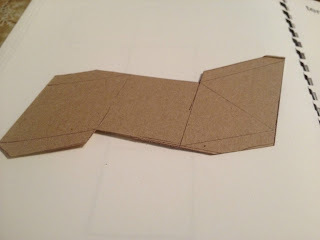 I started cutting fabric months ago, and today it took me ages to figure out what my plan months ago had been. Once I figured it out I got back to work. Still cutting. Didn't get as much done as I would have liked, but am pleased to have gotten some new fabrics to add to the design. There was an exchange table today, so some of someone else's discard clutter came into my house. Today also a quilt was presented to a retired Lieutenant Colonel. 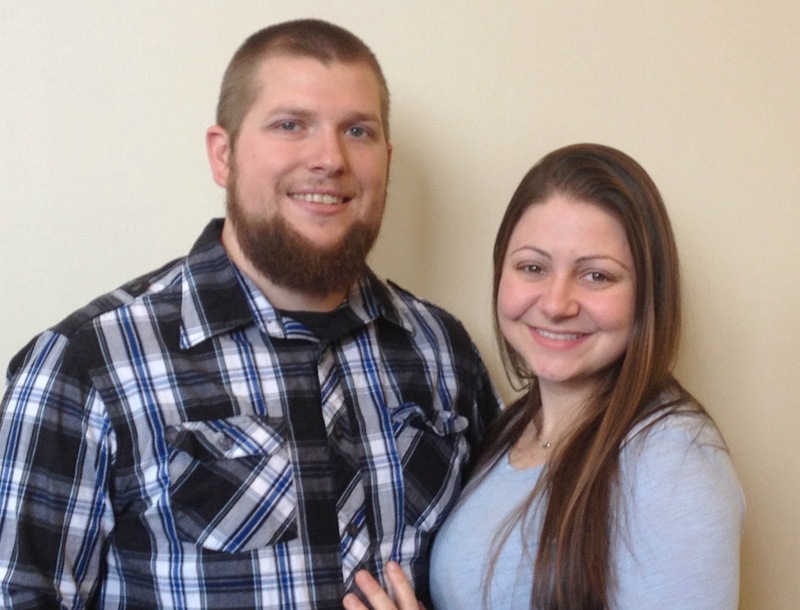 His life was turned around in childhood by his 4th Grade teacher! One day he finally located her to thank her. This quilt was made by this teacher for this veteran! So cool! It rained all day, so it was a good day to be quilting! What did you do today? My son's first college course was finally completed one week ago today. Saturday my son was set to take an "O-Flight" (Orientation Flight) -- a Civil Air Patrol "perk". It was rained out. It was the sixth flight he has been scheduled to take. It was the sixth flight to be cancelled due to rain, weather, pilot's broken foot, air plane's engine trouble, etc. ::sigh:: My cadet dressed in his BDUs (Basic Dress Uniform) but did not fly. Sunday we drove the approximately 65 miles to visit our adult married daughter in the next state south of us. 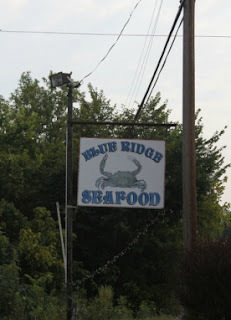 We enjoyed our visit, and ended with a dinner out at a little family restaurant called Blue Ridge Sea Food. Monday night was our Boy Scout Troop meeting. Hubby is Scout Master; I am an Asst. SM. Okay, this photo is from our Eagle Court of Honor 2 weeks ago. I didn't take a photo on Monday night. The Scouts fixed a pot hole in the parking lot and planned for a camping trip on Saturday. Two Scouts worked with me on merit badges, and one Scout had a Scout Master conference, a Board of Review, and a rank advancement. Tuesday night we went to our tutor for Algebra 2. Wednesday was our anniversary - our 37th anniversary! 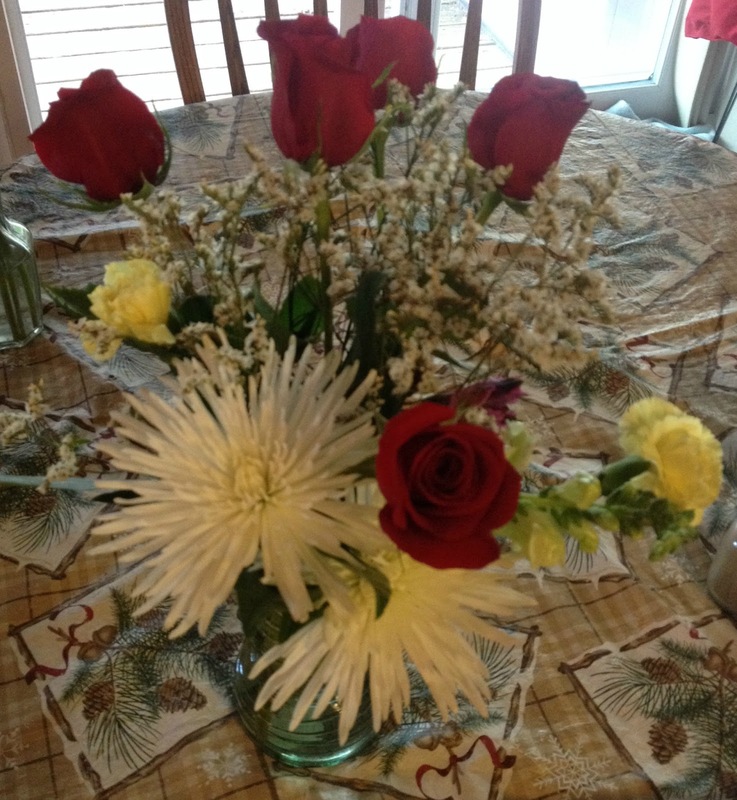 Hubby got me flowers and sweets. We went out to dinner. The restaurant gave us flowers! We had some ice cream after dinner! Thursday night was Civil Air Patrol. Just kidding! It was Physical Therapy night and I don't have a photo. Friday, evaluation day. As far as school work goes, it was a difficult week, hard to keep my son focused. Logic studies side-railed by a desire to paint his rocket for tomorrow's scheduled rocket launch. Truth be told, the launch might have to be postponed. Weather is predicting 100% chance of rain! The Scouts' camping trip was cancelled -- who wants 20 teen-aged boys to be cooped up in tents in the rain all day with nothing to do. I'm planning to meet with my quilting group to work on a quilt tomorrow. So, tell me about your week! In March I learned that we had the opportunity to review Traditional Logic I Complete Set by Memoria Press. I've used Memoria Press materials in the past and been very pleased with them. To top it off, though, my son was expressing a desire to study logic, so it was the perfect fit and the perfect time for us! 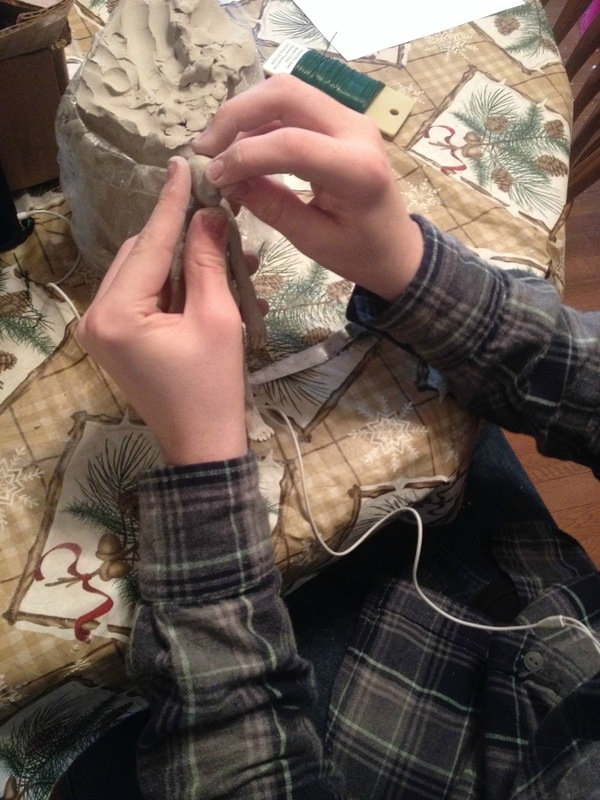 Initially, when the program arrived, my son was up to his eyeballs in a college course. Needing to begin the review, and wanting to study Logic myself, I started the program without him. The Traditional Logic is for students in grades 7-12. 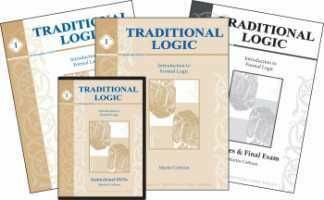 The Traditional Logic I Complete Set, which we received, comes with instructional DVDs, the Workbook which the student uses, the book of Quizzes and Tests, and the Teacher Key (answers for the Workbook and Quizzes and Tests). 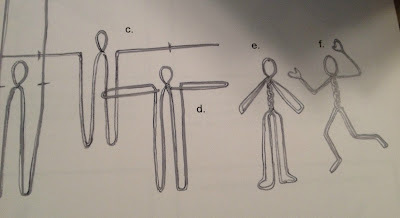 In initial perusal I found, in the Workbook, "A Note to the Teacher", so I started there. 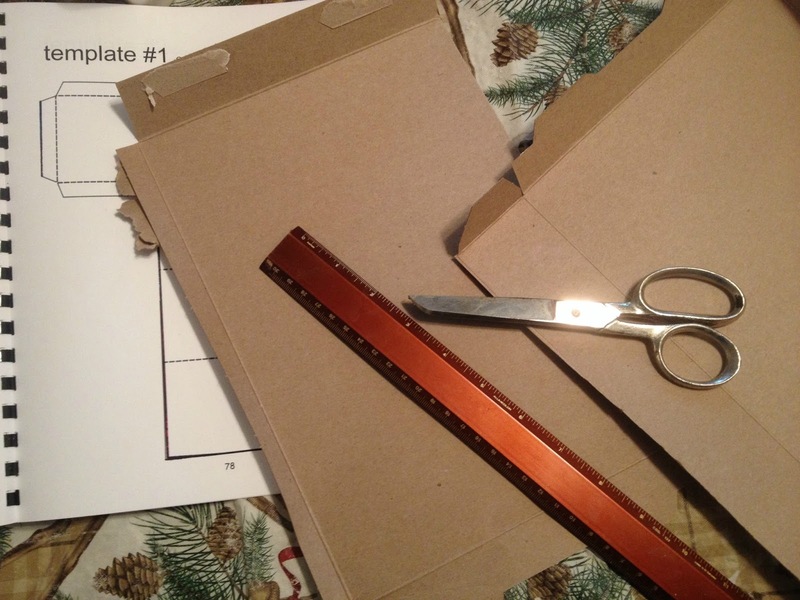 Next I watched the first instructional video (the "Introduction") on the first DVD, and then worked on the Workbook. I like the DVDs. This might sound funny, but for my son (who is easily distracted and very critical of much educational media), it is watchable. The instructor is not a distraction. This probably sounds funny (or judgmental) to those of you who have never had a kid who gets distracted, but there are no crooked teeth, no glasses with light reflecting off of them. The teacher doesn't talk funny-sounding to us, like a southern twang accent. The instruction is therefore totally palatable for us (my student). Does that make sense? 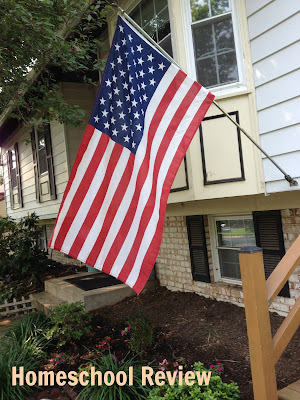 When my son was finally free of his college course, I reminded him that we had the logic, and he dived in. I forgot to tell him to watch the DVD first, and as a result he initially found the course dry and boring. Fortunately I remembered after his first day in the material, so quick recovery! The course is set up with the Introduction and 13 chapters (the Introduction is like one of the chapters). Each chapter is done over the course of a week. The student watches the lesson, reads the material, and each day answers a section of questions. After each week the student takes a quiz. There is only one test, at the end of the semester, so theoretically the book should be called Quizzes and Test instead of "Quizzes and Tests", but maybe that's just me... This is a one-semester course, for high school, so for a full credit you would do Traditional Logic II in the second semester. For younger students the course can be spread out over a full year, but it is still only 1/2 credit on a high school transcript. I've enjoyed the work I've done so far in Traditional Logic, but I'm even more delighted that my son got the program started too! When he catches up to me I am hoping we can watch the videos together and discuss the material each week. I plan to encourage him to stick with it, because I really think he will like the material in weeks 7 and 8. I'd love for us to get to a place where we can look at each other and whisper, "Red herring!" and share an understanding as to where the logic broke down in the political speech we were watching or whatever. I'll always remember The Lion, The Witch and The Wardrobe (C.S. Lewis), and the professor saying, "What do they teach children in schools these days?..." The study of logic is, in many ways, similar to the study of Math. They are related. Math is logical, and Logic and Math both build higher level thinking skills. My son is not happy to study Math. If at some point my son ends up disliking Logic, I'll have to chalk it up to the similarities between Logic and Math. For the time being, though, he is giving it a chance. As a way to study logic, I give Traditional Logic 2-thumbs up! I do l like this program! And Memoria Press still scores 100% as a publisher whose materials I love! Other members of the Review Crew also this and other products by Memoria Press. To see other product reviews, please click the button below. 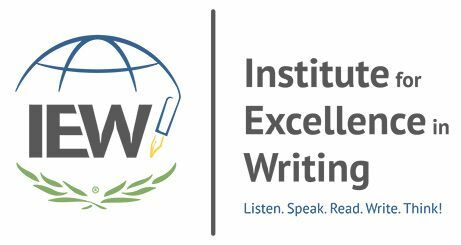 In March I learned that we had been selected to review a new product by Institute for Excellence in Writing (IEW). 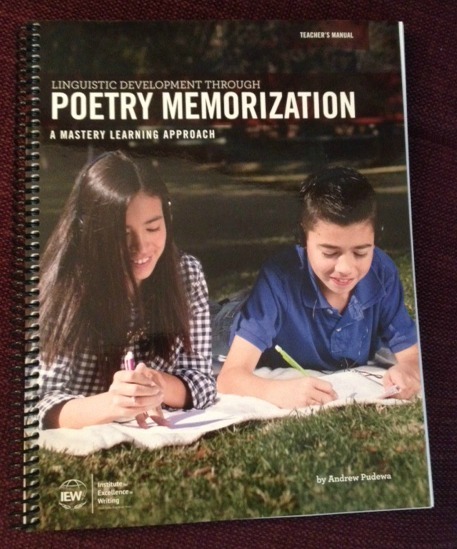 Not long thereafter a package arrived in the mail containing Linguistic Development through Poetry Memorization. 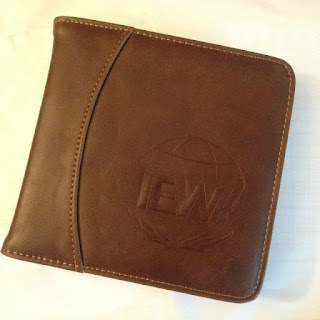 If you've been reading my blog through the years, you know by now that I like products from IEW. They make quality products, and they present their CDs and DVDs in quality packaging. Look at that disk storage case! I don't think it is real leather, but it is beautiful! The disc case contains five audio CDs (recordings of the poems for memorization) and a DVD of Andrew Pudewa giving a presentation called Nurturing Competent Communicators. as well as a digital e-book of the student edition. Having a digital student means you can download and print as many copies as you need for the number of students/children you have in your family! You also have the option of purchasing a spiral-bound student edition from IEW if you want one! 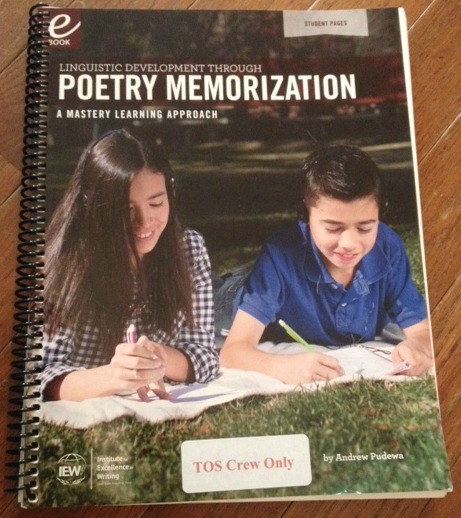 IEW was very generous to Crew members and sent a printed copy of the Student Pages in addition to the full set of Linguistic Development through Poetry Memorization. The glossy cover is causing light glare, so I apologize that it is not a crisp photo. The book covers are beautiful! 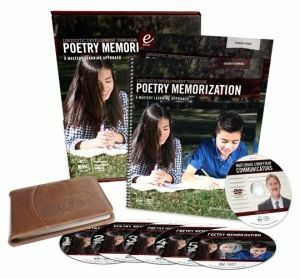 Isn't that amazing, how much is included in the Poetry Memorization package? I love the way IEW is working to equip parents in the task of educating their children! When I received Poetry Memorization, I initially assumed we'd jump into the program at a level commiserate with my son's grade level or something. Like a good homeschool mom, though, I started by opening the Teacher's Manual and reading the Introduction. The material makes it very clear that all students, regardless of age, begin at the very beginning. Well, at least there is no ambiguity. 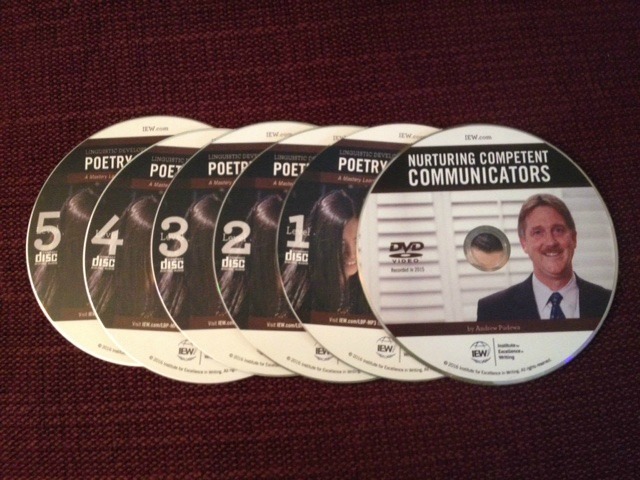 Before I gave my son his first poem, I also watched the Nurturing Competent Communicators DVD. Very inspiring! I was ready to go! We both had Ooey Gooey memorized on day 1. The recommended pace to cover the poems is one poem per week. It is expected that older students starting the course at the beginning will go at a faster pace initially. I was feeling good. ("We've 'got' this!") I liked the worm picture and colored it in, since my son's not usually much of one for coloring. We got to poem 2 the same week. Again, very easy poem. I'm feeling good about our progress. At this time my son was neck-deep in his college class, English 101, so I willingly dropped the pace to make sure this stays fun for him. The method of easy learning in this memorization course calls for reading the poem every day, listening to the audio CDs to recite the poem together. You practice the poem every day until the student *owns* the content. The poems become progressively harder, and it is okay to move on to the next poem before the student totally remembers the poem because you continue to practice the poems you have already memorized. We did not do perfectly at practicing the poems every day initially, but we got better as we moved along, especially not that my son's college course is ended. One of the poems is by Hughes Mearns, and personally I am struggling with the name. It isn't bad enough that for years I thought the author was someone else; I also just have trouble wrapping my very tongue around pronouncing the name. I never thought remembering the authors might be more challenging than remembering some of the poems, but now I realize it is very true! This will build on my son's vocabulary. It will develop sophisticated language patterns in his brain. My son will learn how to correctly connect artistically crafted phrases together. 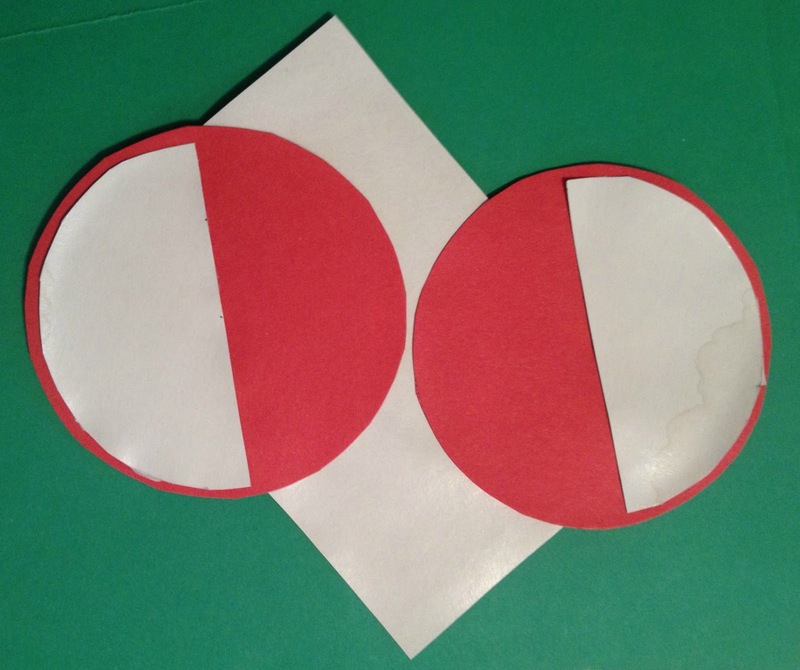 This will help him to use the new language patterns intuitively. My son will be able to read new material and detect correct or awkward word usage. Poetry is good for the soul. 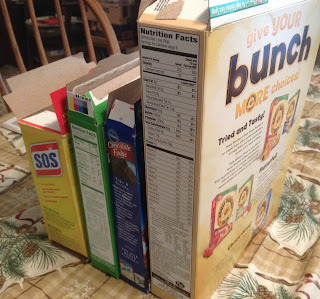 My son will store a repertoire of poetry he can recite to entertain. Memorization of this poetry will help my son in other subjects because of neuron connections his brain will be making from memorizing poems! I'm really excited about the potential long term benefits! I'm also longing to hear my son recite from memory some of the later pieces, but I'm going to bide my time and let him get there with no short-cuts. I still can't wait! I found the Teacher's Edition has an Appendix 1 with short biographies of the authors of the poems in the program, which is nice. Appendix 2 is a bibliography, and Appendix 3 gives lesson enhancement ideas. I haven't listened to all the audio MP3 downloads yet. With summer looming ahead of me, I am looking forward to some quality beneficial listening! I am also hoping I can get my son to continue to work on the memorization through the summer at... whatever pace! I'm loving the poems. They're light and funny right now. Later in the program there are some great pieces I can't wait to memorize. Some are poems my son memorized in the past, but does not remember. Linguistic Development through Poetry Memorization, by Andrew Pudewa and IEW, gets two thumbs up from this Momma. My son likes Andrew Pudewa but has not given me a positive opinion of the program. Then again, he hasn't complained, which probably a compliment considering my son. 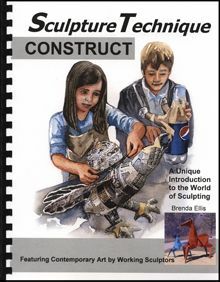 I recommend you consider this program for your own homeschool, regardless of the age(s) of your student(s). Here are my plans for this week. 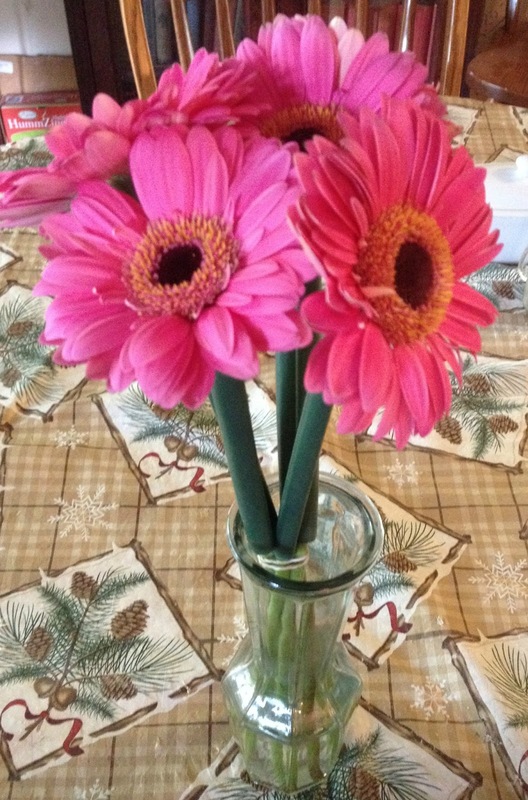 You'll see they are not entirely healthy -- one of those weeks where I opted for "Make it easy; get 'er done!" over careful healthy planning. I should be posting a more thought-out, healthy plan next week, but for this week my guys will be happy! They like these meals. We've reached the end of another week. It rained today --14th day in a row! The sun is shining now. I have some grass I need to mow tomorrow, but there is an 80% chance of rain. Again. The cadet is scheduled for an "O Flight" tomorrow. I don't know if it will happen. It is the 6th time we have scheduled, yet he has never flown. 1) rain; 2) rain; 3) pilot broke ankle; 4) pilot's ankle was still not well; 5) airplane got a flat tire on runway, nose-dived and burned out engine; 6) tomorrow. Don't know if engine is fixed; haven't heard. The biggest milestone this week is that the student, who has been taking English 101 at the local community college (a dual enrollment class) has handed in his last assignment for the semester. Final grade will come when the teacher grades the paper, but I think he will receive a B for the class. He has done a good job for a tenth grader! We learned today that he doesn't actually have to take the ACT or the SAT because he is already enrolled in the community college. He was admitted based on his scores on the PSAT and the Accuplacer tests. His courses for next semester have been approved. He will be taking History of the 20th century and a second English course. The student had a good week in Algebra 2. We have made progress in square roots, factoring, and formula memorization. His tutoring session went very well this week. I know how to do the math, I just don't teach it very well and I'm not very encouraging. I get stuck in a mode sort of like, "This is how you do it. Just do it! Here's your assignment!" Yeah. I think we will be able to expand out into a program called LearnBop to get more perspective on the Algebra 2, and next year the Geometry. We did not make good progress in History this week, but the focus has been finishing English. Now that the student can focus more of his time on his History studies, I will be having him work on a portfolio of his History topics, with Notebooking Pages for individuals of note in the 19th Century. We had fun this week with composer study and art as we finished up two reviews. More work could be done, but enough has been done for me to give credit, so I'm not concerned about scheduling more Fine Arts just now. I will be having the student do some Notebooking Pages of some of the composers and artists we have been studying. I am hoping to be assigned to review a program called "ArtAchieve", though. 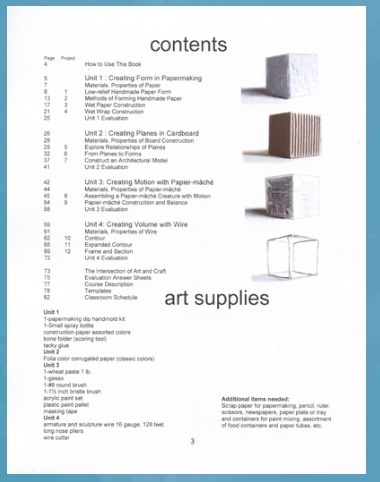 If so there will be more lessons, this time more on drawing and shading, shapes and dimensions. We are working concurrently on IEW Poetry Memorization and Memoria Press Traditional Logic. Very good stuff! Be watching for reviews next week. We have also started a novel called The Glass Castle that we will be working on. We still need to finish A Tale of Two Cities and Gulliver's Travels for our Literature credit this year. Sorry no photos for now. Will try to put some in later if I get a chance. Happy home schooling! In March I was asked if I would consider reviewing an art instruction book for ARTistic Pursuits Inc. Specifically, ARTistic Pursuits was hoping to find reviewers who had previously reviewed their one of their Sculpture Techniques books to review the other book in the series. 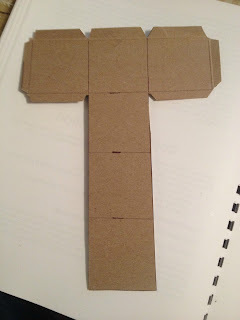 A couple of years ago I reviewed Sculpture Technique: Build, so I offered to review Sculpture Technique: Construct. Looking also at the required materials, between scrounging trash and my previous art supply acquisitions, I had everything I needed, almost. You'll never guess what the hardest thing was for me to scrounge up: newspaper for the papier-mâché! Who would have thought, ten years ago, that free newspaper would be non-existent in so many households? I finally found some at the local coffee shop that had been read and discarded for whoever wanted it. So now that I knew I was ready for any of the units/lessons, I handed the book to my son and asked him to pick something we could work on for art. He was immediately drawn to the wire art section. I was glad he skipped paper making for now. I've done paper making with my daughter(s), and I know it can be hard on my blender. If he decides to make paper later, I am ready (if not enthusiastic). 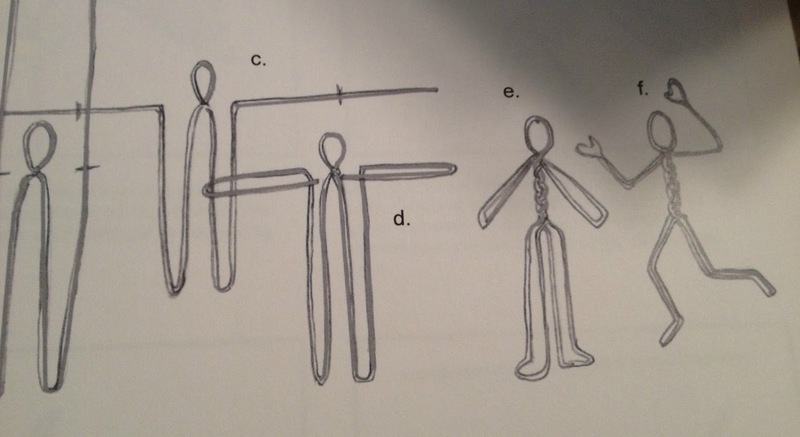 The section he selected gives instruction on making human, animal and other shapes out of wire. 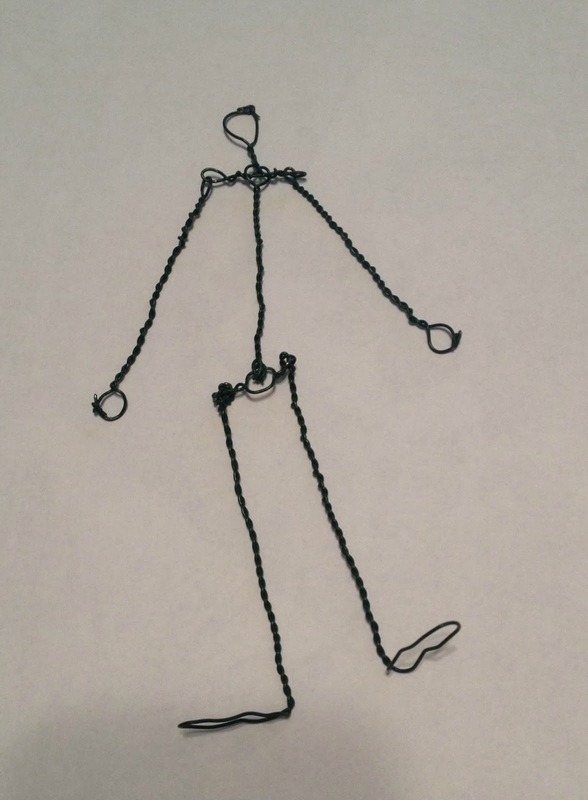 My son decided to make a human figurine. 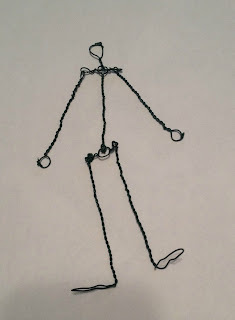 Using floral wire that was left over from the flower preparations for my daughter's wedding in 2013, he quickly made a 5" skeleton frame for a human. 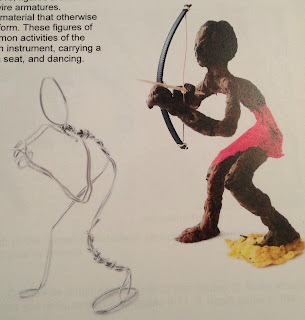 The book then gives instructions on finishing the figurines in papier-mâché. 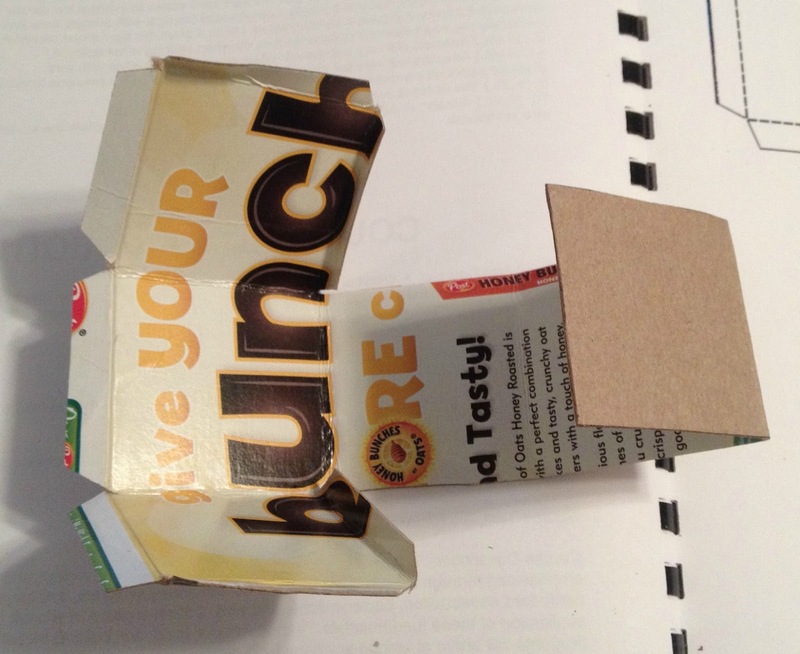 Um... My son has his own ideas and often does not read instructions. He asked me for clay. We had it, so I told him where to find it. 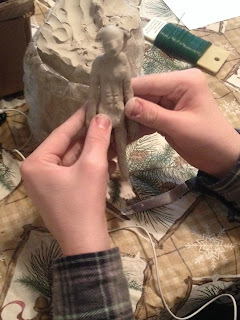 He finished his (naked) figurine in clay. It turned out wonderfully! The cereal box was opened up and laid flat, then trimmed down to a size appropriate to the template provided in the book. 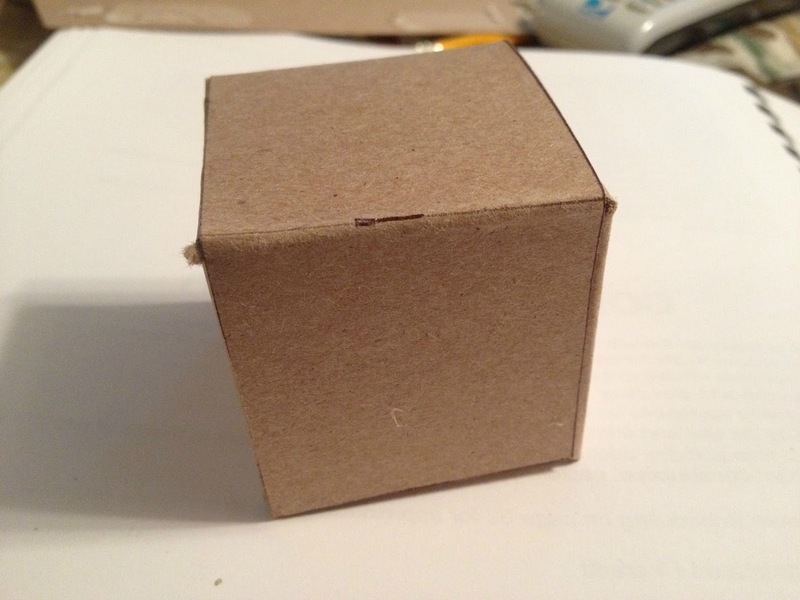 The cube template was replicated on the cardboard using the ruler and the pen. The fold lines were creased. Then the flaps were glued. If you top a cube with a pyramid, you get a basic house construction, so the next shape tackled was the pyramid. Same concept, the template was transferred to the cardboard, it was cut out, folded and then glued. Then it was stacked on the cube. 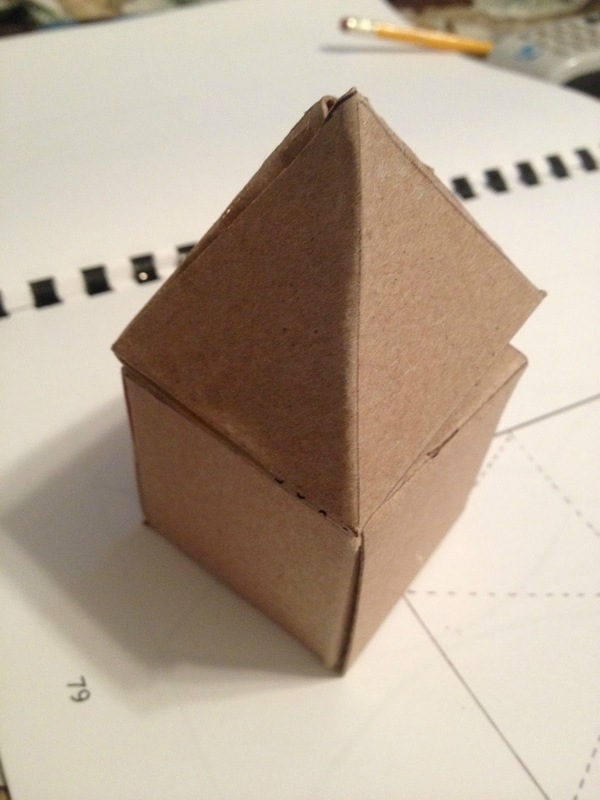 The pyramid didn't turn out as well as the cube -- probably the pattern was not copied as well. I don't know what else my son will do from this book, but it would be fun if I could get him to create a papier-mâché animal and a wire figure of a boat or a fish, maybe a mobile. We'll have to see if I can get him to do some more work. I appreciate ARTistic Pursuits permitting me to review Sculpture Technique: Construct for them. I have loved every book I have ever tried by ARTistic Pursuits, and I strongly recommend all of the books in the various grade levels. I encourage you to try one! 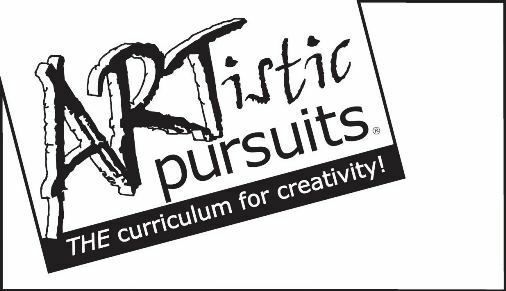 Other members of the Review Crew also reviewed ARTistic Pursuits products. To see other product reviews, please click the button below.